Drag Kart Running 9.81 @ 131 MPH On ¼ Mile! Must see! Yeah folks, as the title say we have a 9-second drag kart here. This is pretty insane, huh? Well, it looks like they have different regulations in England and they found this very normal. The race below comes from the United Kingdom Drag Kart Series at the 2017 Ultimate Street Car. The driver behind the wheel of this monstrous go-kart is Scott Cooper. You can actually see him running two below 10 second runs. His best run is 9.81 seconds at staggering 131 mph. You`ll see a 7.8 time as well, but that`s ridiculous as one of the light bulbs malfunctioned. Nevertheless, who would`ve guessed that 9-second go kart was a thing, huh? The driver and also builder of this go-kart, Scott Cooper, is actually a true veteran of the sport. 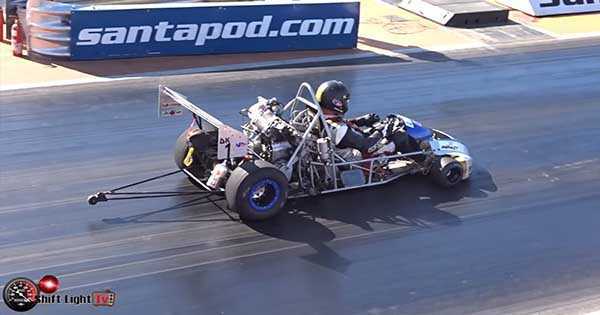 This insane drag kart is actually fitted with a nitrous bottle and a baby supercharger. However, there are things that we are curious about. Who`s the manufacturer of those slicks and wheels? Other thing we are very much interested about is the power plant. We also wonder whether or not this go-kart uses methanol fuel. Other thing we want to compliment is how much we admire the courage these guys have. We mean, going at that immense speed with a go-kart that has no rolling cage or anything like that is pretty much insane. We also wonder how come this is allowed considering the safety regulations in motorsport nowadays. We mean they want to install a roll cage in F1 now for crying out loud and F1 has the safest chassis in all of motorsport. At last, check out the fastest go kart in the World!